Those of you who are regular readers of the UMTRR know about the "Door Thing"-- instances in which Micro-Trains releases a car that has a different size door opening on the prototype than on the model. This is usually on the 20000 series PS-1 single door box car; the MTL model has a six foot door opening while many prototype PS-1s, especially later ones, have a seven or eight foot door opening. One such car is Catalog Number 20062 for the Southern Railway, a reprint issued in May 1998 as part of the "25th Anniversary Reprint" series of the original "Class of '72" box cars that started it all in Micro-Trains freight cars. The prototype of this car had an eight foot door. Instead of complaining about it, though, I asked myself, "Self, why don't you put your money where your mouth is?" And so I did. It's a pretty easy and straightforward project that will add some variety to your accumulated fleet of Micro-Trains runners. The first step is removal of the protruding rib that keeps the door from going too far left on the model. I used a standard hobby knife with #11 blade for this, working slowly and with several passes to carve the rib away, down to the level of the rest of the car side. It doesn't have to be perfect as it will be covered by the larger door. Hold the door straight, square and flush against the opening, then cement it in from the back with your favorite watery plastic cement. [I used Ambroid "Pro-Weld" but that's one of three brands "in stock" at UMTRR HQ.] There will be a noticable opening at the base of the door; when a six foot door is installed, the gap allows the door to slide. 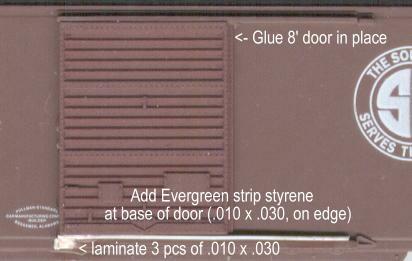 I had just made the door non-operating so to fill the gap, I inserted a short piece of Evergreen strip stryene, .010" x .030" dimension, turned on its long side. I cut this by eye to line up with the already molded in door slide, and glued it against the slide. It is a little bit thicker than the slide and therefore sticks out a bit, but that's OK for me. Since the eight foot door is wider and protudes a little bit past the left end of the bottom door guide, I "extended" it slightly by laminating three pieces of the same .010" x .030" strip styrene, again cutting it by eye. This step probably wasn't completely necessary-- in fact, I skipped it on the other side of the car-- but it does lend a little more credibility to the idea that this car is supposed to have the larger door. With a little bit of closely matching paint, the plastic pieces that have been added are blended into the existing car side. I used an old bottle of Polly S "Boxcar Red" which isn't a perfect match, but close enough. There should be more brown than red in whatever shade you select for this particular car. Micro-Trains uses a variety of shades of "box car red" (just like the real railroads did and do!) so be sure to choose based on the specific car being modified. If the eight foot door isn't that close to the color of the car side it might be a good idea to paint that too before going on to the weathering. Mine was close enough so I let it be. You are going to weather it, right? Well, of course I weathered it, rather heavily, in fact, because the built date on the car is 1948 and that's fifteen years before the setting date of 1963 on my Wilmington and New York Railroad, on which this car will run. I also cut the couplers off the MTL standard issue trucks and body mounted these couplers, and switched the standard 1007 wheels that came with the car with the MTL low profile 1008s as is my custom on the cars that I weather. (I call this my "blue dot" process; with apologies to the folks at RPI who use the term "green dot" to refer to cars that are reworked to the standards in place there for a prototypically faithful HO Scale model. Trust me, guys, it's a tribute!) The paints I used were the same Polly S "Boxcar Red" as the base coat for the weathering, a little bit of Polly Scale "Mineral Red" to add a suggestion of rust around the doors, ladders, and the bottom of the car as the color for the trucks and couplers, and Polly Scale "Grimy Black" as a drybrush final addition in some random spots including the roof. I also stole the underframe from the same 23000 double door car from which I purloined the doors, since I'd previously airbrushed it with Accuflex "Light Tuscan Oxide Red." And that's all there is to it. Between interruptions (you know, the usual: work, family, eating, sleeping), it took less than an hour total effort time to complete this project. 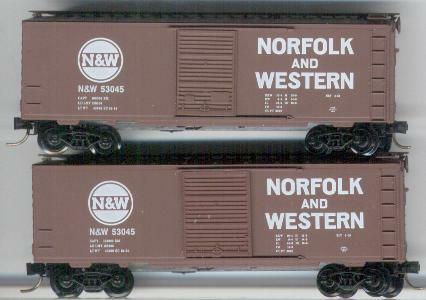 Here's another "before and after" straight comparison between the out of the box version of the 20039 Norfolk and Western box car, and the same car with the eight foot door changed in. The 23240 Ashley, Drew and Northern double door box car provided the eight foot doors; it's a close enough match for the color that I didn't feel a need to repaint. Good thing, as the Approximate Time Period for this car means it would be relatively clean for operation on my layout. So I couldn't hide the color variation behind heavy weathering this time. I also didn't add the extra Evergreen styrene parts, which I may go back to later; in a train it wouldn't be that noticable. The point here is the variety, not so much the perfect replication of an eight foot door opening box car. You're not restricted to 20000 series boxcars of the 1950's and 1960's, either. This is the 73010 Santa Fe box car with no roofwalk and full size ladders, released in November 2001. The prototype Bx-136 was given eight foot wide doors when rebuilt from the Santa Fe's Bx-53 series in 1969. And here it is after "the treatment." This was more than just changing to eight foot doors; said doors had to be painted white to match the prototype. (Covering brown with white is rarely easy. Try a coat of gray primer first.) Bx-136 photos in "The Priest Book," officially known as "Santa Fe Freight in Color... the Series, Volume One, Box Cars" by Stephen Priest, show the car with a straight bottom sill, so I chiseled off the protruding parts of the bottom of the 73010. Note that you'll need to be more careful handling the car since the bottom is more likely to fall out when you do this modification! A bit of Goo might help secure things.) I also dropped an Micro-Scale decal ACI label to the left of the consolidated stencils, as per photos in the Priest book. I cut the couplers off the trucks and body mounted them, as is my practice. They were placed a bit outboard of the floor to simulate slightly extended draft gear. The MTL Bettendorf trucks got MTL 1008 low profile wheels, but probably should be flipped to roller bearing style to be more precise. I simply didn't have any of those when I did this. Weathering was done with washes of light tuscan oxide red, dirt, and reefer white (all Polly Scale brand, water base) to give the hot, dusty appearance that some Santa Fe cars seem to take on as a result of their life in the Southwestern United States. The shade of "boxcar red" does appear noticably different in the modified example than the out of the box MTL car. This is the 73010 again, this time without the weathering. The couplers this time are straight 1023's, not the couplers cut off the stock trucks. And this one is the later release 73040, which actually represents an earlier version of the car, as rebuilt in 1969. This time there are brown roller bearing trucks per the request of the person I did this for. The ACI label is next to the big circle cross this time as shown in the Priest book (what would I do without it?). Meanwhile, the next question is, what do I do with several pair of six foot doors, and a 40 foot double door boxcar that donated two pair of eight foot doors? Well... stay tuned!